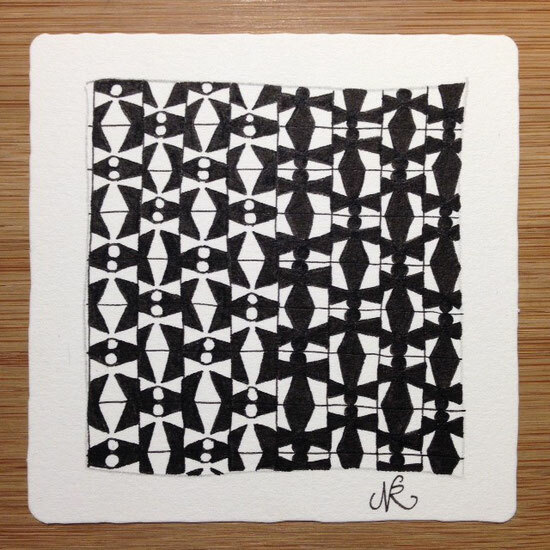 #DC294: Reticula/Fragment Beginning - zentangledichgluecklichs Webseite! Ich habe mein neues Muster ANTACAS als 2 Fragmente ausprobiert. Es hat geklappt und gefällt mir. Wenn ihr genauer wissen wollt, was es mit Reticula und Fragmenten auf sich hat , könnt ihr das im Primer Vol.1 nachlesen oder eine schöne Zusammenfassung in Jennifer Hohensteiners Blogeintrag. Danke an Laura für diese tolle Challenge. Es hat mir Spaß bereitet! I should be in bed already. Nonetheless i want to post my tiles for Laura`s Challenge 294 this week. I tried my new pattern ANTACAS as fragments. It worked and i like it. Thank you Laura for this awesome challenge. I have had a lot of fun! Antakas looks wonderful as a fragment and certainly with variations and using the fragments in different direction, I like this tile very much and thank you for sharing. I wish you a merry Christmas and a happy Newyear with lots of tanglepleaure. Super Muster & tolle Umsetzung, liebe Nadine! I love the boldly designed fragments that you used! Very beautiful; a bit like Esscher. Great outcome! 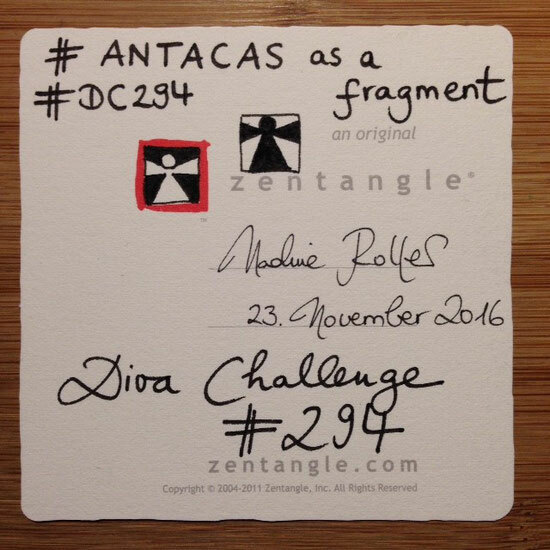 I want to try ANTACAS! Cool! Liebe Nadine, ich liebe Antacas! Und es sieht auch als Fragment klasse aus! Der Positiv-Negativ-Effekt ist wunderbar! You have such a delightful way with a pen Nadine! This is lovely. I could never manage to make so many straight lines look so graceful - so I appreciate this all the more.